I have worked as a food and cookbook photographer for many years, and during my photo travels, I have come to view color as an integral element in making food look its very best. 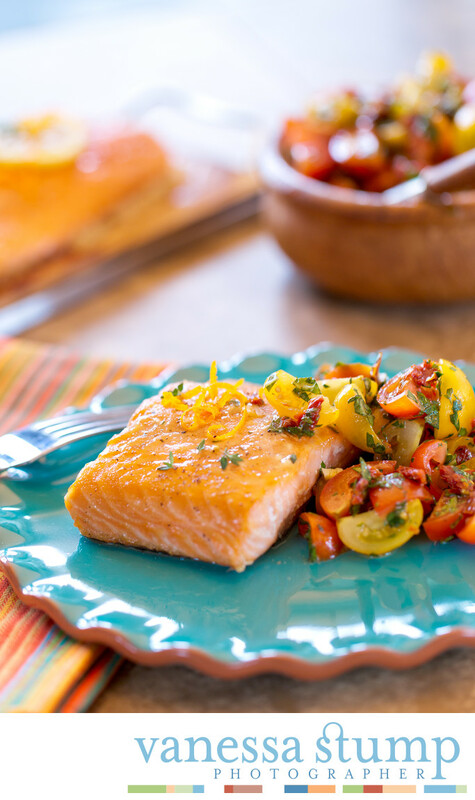 The psychology of color comes into play in all sorts of things, and for this photo of a cedar planked salmon filet with tomatoes, the use of a turquoise serving dish makes all the difference. The interplay between the turquoise dish and the salmon fish brings to bear a reaction that prompts interest in the viewer. The addition of red and yellow cherry tomatoes with fresh parsley gives the setup an added pop.